What is the legacy of London 2012? A year ago, I was feeling the butterflies and getting ready to make my final trip into the Olympic Stadium to perform in the London 2012 Opening Ceremony, after a summer of rehearsals. Today, the press is asking whether the Olympics was worth the money. The BBC has published a survey that says more than two-thirds of the public think it was worth the £8.77 billion it cost. Surveys like this always make me wonder how people are visualising that amount of money, and whether they can really understand how much it is. I can't. Nor can the government, otherwise the budget wouldn't have tripled from its original estimate. The difficulty is that the return from that investment is almost impossible to measure. The government claims that the games boosted trade and investment by £9.9 billion, but that's another number that's so vast it is impossible to understand what influenced all those buyers. What is clear is that the games had an immeasurable positive impact on London and the UK. I was part of the Olympic Opening Ceremony, and one of the most moving aspects of that was the "This is for Everyone" message. It appeared in a segment that was a tribute to Tim Berners-Lee, creator of the World Wide Web, but it summed up how inclusive the whole of the London Olympics were. There were affordable tickets, screens in the parks, and continuous TV coverage, on top of the torch visiting almost everyone. In a culture that is dominated by cynicism and celebrity, the Olympic athletes inspired us by giving us something real to wonder at and believe in. It lifted the nation's mood, even on the Underground commute. The volunteers (both Games Makers and ceremonies volunteers I worked with) were generous with their time and energy, and seized the opportunity to be part of something special. According to BBC Newsround, half of 8 to 12 year-olds said the Paralympics were more inspiring than the Olympics. Newsround also reported on Yasmin, a 13 year-old with cerebral palsy who took up wheelchair racing after watching the Paralympics. The Olympics promised to inspire a generation, and stories like this show how receptive many young people were to that message, and to the inclusive spirit of the London 2012 games. 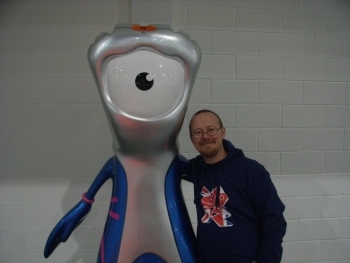 The Olympics gave me some wonderful experiences. Not just taking part in the ceremony; but also seeing the sports; and seeing the country at its best, generous of spirit and truly inspired. Perhaps the best legacy is remembering what the Olympics taught us about what we can be.